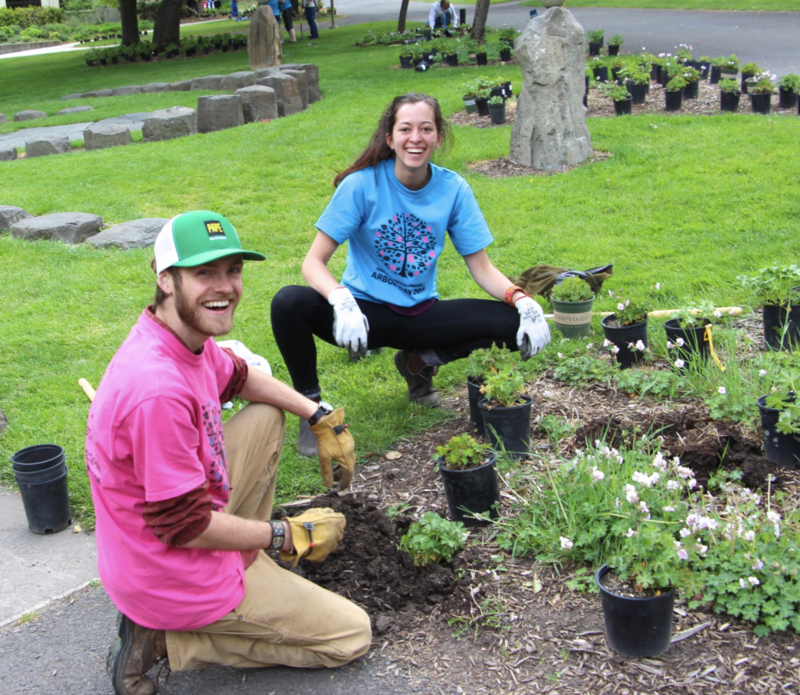 On Friday, the leaders of SOU’s beautification traded their hard worn facilities t-shirt for bright pink Arbor Day shirts and lead the campus in a day of botanical tours and tree planting. The Landscape Department works to assure that SOU’s grounds stay pristine and well maintained. They start work before sunrise, de-icing walkways in the winter and fighting broken sprinkler heads in the summer. Landscape staff and student workers roll up their sleeves to pick weeds, cut unsafe tree limbs, and mow lawns. 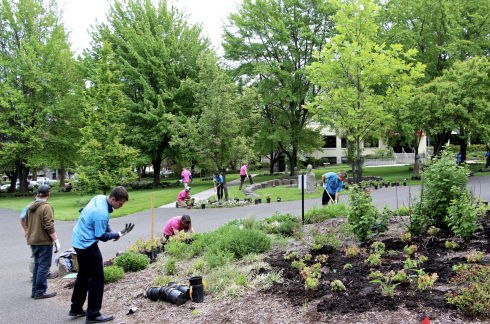 And although the department is recognized for being one of the most inclusive organizations on campus, they seldom have interactions with the student body, except on Arbor Day. Arbor Day started in 2014 when SOU became a Tree Campus USA. Each year since, in order to qualify as a Tree Campus USA, they are required to host an Arbor Day Celebration. 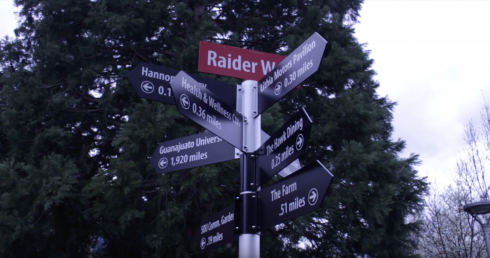 For SOU’s Landscape Department, that means recruiting staff, faculty, and students to help plant more than 6,000 plants around campus, along with facilitating educational tours, guest speaker presentations, a raffle, and hanging out free t-shirts. 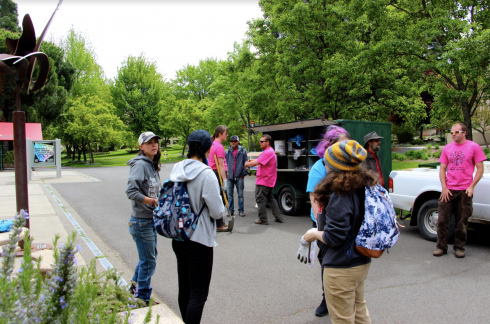 This year on a cloudy afternoon, students, faculty, and community members gathered at the t-shirt booth to follow instructions from the Landscape Department then scattered around trees to begin planting. Students passing by stopped to socialized or help plant a sapling or two, nobody seemed to mind the cold or getting dirty. “I think that planting pollinator friendly plants and giving back to our SOU campus is so important,” SOU. Environmental Science major Sara Evans exclaimed. “Spending the day with friends and being outside is a plus as well! It was a great day in the sun.” This was not the first year the students had participated in the annual Arbor Day event, but this year she saw it advertised one the Inside Sou webpage and was thrilled for the opportunity. The Landscape Department’s effort to preserve and sustain the campus grounds is so exceptional that they have been recognized on multiple occasions for their outstanding work. Beginning in 2014, SOU qualified as the first Bee Campus USA along with annually qualifying as a Tree Campus USA. Friends of the Earth Publication recognized SOU as one of the leading institutions in environmentally-friendly campuses in the country, and the Landscape Department was asked to present at the Association for Advancement of Sustainability at Higher Education Conference (AASHE) in Baltimore. Their presentation included information on how other campuses can become a Tree Campus USA, host environmental sustainability events like Arbor Day, and reduce herbicide chemicals in the landscape. Arbor Day is just one of many events held at SOU intended to maintain the respectable environmental reputation we hold. 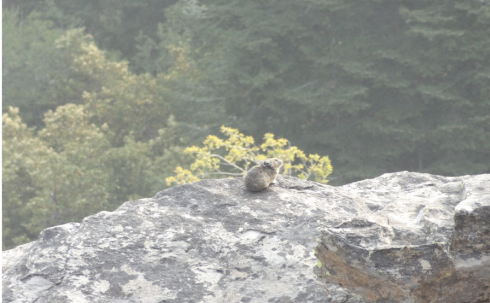 The Landscape Team and other environmental groups on campus such as ECOS, OSIPRIG, the Farm also host presentations, volunteer opportunities, and educational outreach programs to continue campus environmental sustainability.